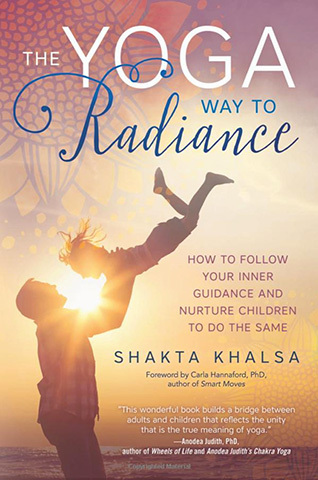 In The Yoga Way to Radiance, a highly informative and heart-centered book, Shakta Khalsa explains her belief that caring for children is the highest path of yoga. She encourages each parent, grandparent, and everyone working with children, to first step into their own authentic selves in order to reflect that authenticity to the children they nurture. 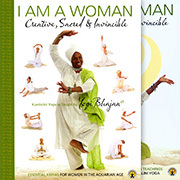 In every chapter she provides stories, meditations, energy work and yoga activities that assist to remember and live from our inner place of truth, being our own light, and the light for all those around us. “This wonderful book builds a bridge between adults and children that reflects the unity that is the true meaning of yoga”. – Anodea Judith, Ph.D.
During this experiential journey, explore yoga-based tools to help you embrace your true self, and to live with wonder and joy as you care for the children in your life. The Yoga Way to Radiance has been written with the intention of helping you reclaim your authentic self while also helping the children around you stay connected to their own inner radiance. Discover how to guide yourself and the children in your life to be the radiant, authentic beings that you all truly are, and how to connect to your kids through centered parenting and yoga, bringing a newfound sense of joy and freedom to the adult-child relationship. Fun, effective yoga exercises and meditations for children and adults. Ancient wisdom and leading-edge teachings to help children be the radiant beings that they are. Techniques for staying connected to your inner self while meeting challenges with children. Tips for the art of deep listening and neutral, friendly talk. Natural discipline that uses the magic of imagination and natural consequences. How to place trust in a child’s natural self-correcting abilities. Shakta Kaur Khalsa has practiced yoga since 1972 and became a certified Kundalini Yoga instructor in 1976. She is also an AMS-certified Montessori educator. She is the author of a number of well-known books for adults and children as well as the writer of frequent magazine articles, and promoter of her own Radiant Child program – aimed at introducing Kundalini Yoga to children in a fun and inviting manner.